Sony may have taken the crown from Nintendo with their PlayStation consoles, when Megaman and the Final Fantasy series jumped platforms. But Nintendo, seeing that outflanking is better than outgunning, is once again trying to prove that they’re king with the Wii and DS in terms of unique gameplay. Nunchucks, touchscreens, and and a wide variety of applications seem to have done just that. But Nintendo did more than just that with the DS. This time, pervasiveness is another thing they brought to the table. People are bringing their DS along with them everywhere–on the bus, FX, taxis, trains, the bathroom, the office, you name it! A quick look in the “Where do you play your GBA/DS/Micro” thread in http://www.pinoy-n.com will tell you other places people have taken their DS to. And I’m sure you would too. This is all thanks to the wide variety of games and applications available for the DS. While you can definitely play your favorite games anywhere (you should definitely try shouting “Objection” with Phoenix Wright, blowing DS with Mario Kart’s Balloon Battle Mode, or training your Nintendogs inside the train, although ambient noise can give the DS some difficulty with voice recognition), the DS deserves recognition for everything else not gaming as well. Like when you’re out at Starbucks, sipping your favorite cup of coffee, reading that new book you’ve got. But wait, it’s a Japanese book, and you’re not Japanese. No need to buy those expensive Casio dictionaries, just run Kanji Sonomama Rakubiki Jiten and you’re set. Expecting another boring commute? Don’t bother bringing out your mp4-capable phone with its teensie-weensie screen, just load up your memory card with your favorite movie and sit back. Jogging in the park? Plug in your earphones, rev up the mp3 player, and play music with Moonshell. There’s even an iPod-looking mp3 player called Licks Media Player, complete of course with the ClickWheel dial. If you’re going out for a picnic, maybe you can stop near a WiFi hotspot and browse the ‘net for travel info with the Opera for DS. Oh, and best check live weather forecasts with DSLiveWeather as well. 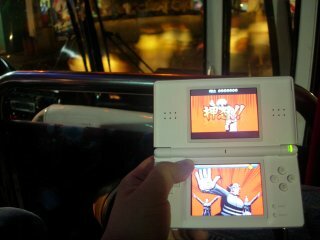 On a recent 9-hour bus trip from Baguio, I couldn’t have been more thankful that I had my well-stocked and well-charged DS with me, though I just alternated between playing Ouendan, Animal Crossing, listening to music, and feeding my dogs. On another occasion, I have played balloon battle in the waiting area of Let’s Face It facial center while waiting for my SO. I tell you, the look of people’s faces as I’m blowing at my DS is priceless. Entry filed under: Entertainment, Lifestyle, Nintendo DS. Adding to this one.. check this out.. DS Tour Guide!